A’Seduction is now 16 years old. We bought him when he was an 8 months old colt. He has won so many Regional and State Championships and so many trophy rugs, I have lost count. We competed in a total of 6 young dressage horse events, every time finishing in the Top 3. He was 3 times a Champion of his Age and twice he was awarded the Champion of Champions. And now this year we have two of his baby girls qualified for the Young Horse Classes at the Sydney CDI. We will also take A’Seduction himself to compete in the Grand Prix International class. So WOW, I never in my dreams thought that this would ever happen. We are very proud of A’Seduction and his two girls. He has produced some amazing lovely trainable young horses. There are many out competing now and doing extremely well. The two girls going in the Sydney CDI Young Horse Classes this year are A Heaven Sent (aka Penny) and A Spider Bite (aka CC). They are going in the 5yo and the 6yo events. The fields are so strong, with so many very nice top quality horses. But you have to realise that they judge just what they see on the day, and if you have a little glitch then you suffer the consequences. Success will show up as the years pass by with many consistent performances, and the results will be on the board. And ultimately, that is what we all want: a well behaved, calm, flowing, active and alive test, then we progress up the classes to Grand Prix. IT’S SO EXCITING!!! A Heaven Sent has the most beautiful temperament, and lovely suspended trot action. She is also a very pretty girl. Pen is my little worker girl, she loves training and practising all her work. When she was growing up, I called her my Nimbin Pony, as she loves to be outside with nature, she loves being in her paddock and she is very laid back about life in general. As she grows and matures, I believe Pen will be the near perfect dressage competitor!! A Spider Bite, and yes she was actually bitten by a spider when she was a yearling, cause I knew you were going to ask, how did she get that name? CC has already won 3 championship rugs herself. And she has won her first test this year, the medium at the NADEC event – she even got a 9 in that test. She was soo well behaved, calm yet a bit excited, just what you need to produce a good test!! We call CC our OH&S (official health and safety) girl: CC makes sure everything is safe before she goes anyway. She is spunky, studious, and is the life at any party she goes to!! CC has the big plan picture already set in her goals… Grand Prix! 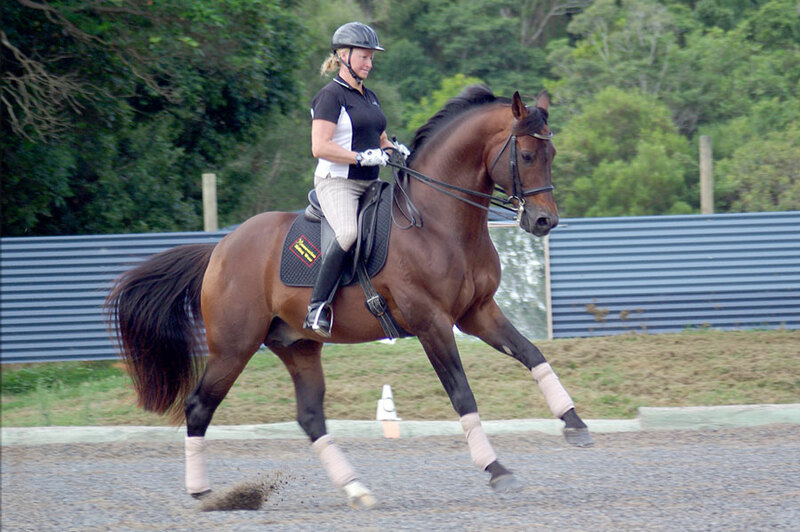 So it is very exciting for Peter and me to have a Family Affair going to the Sydney CDI International 3 Star 2013. And of course thanks to a big team of friends, students and owners, this plan can happen. This entry was posted in A Heaven Sent (Penny), A Spider Bite (CC), A'Seduction (Basil) on 06/04/2013 by Sally.